Depending on where you live, fall clean up and winter preparation can mean many different things. For the purposes of this article I will focus on Wisconsin, where Badger Bonsai Society resides. I’ll discuss winter storage for hardy plants (juniper, pine, maple, etc.) as tropical species (ficus, schefflera, carrissa, etc.) could not possibly be expected to survive the winters of Wisconsin and must move indoors by September 1st or earlier. Wisconsin runs the climate zones from 3-5 which means the temperature can be as low as -10 to -30º f. In my opinion, it’s best to assume that it can drop below -20, if even for a few hours, so the plants must be protected or they can dry out, roots can burst and pottery will shatter. Why not just bring them all inside you ask? Because they are hardy, outdoor trees which require a dormancy, a period of rest. If you keep your hardy trees inside, they will eventually exhaust themselves and die. 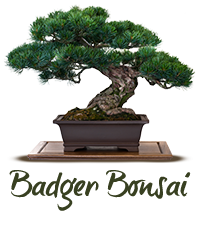 You can overwinter your hardy bonsai in an unheated, rarely used shed or garage, nestled in garden beds, or in a climate controlled greenhouse kept just above freezing, say at 34ºf. Most of us will not have the greenhouse option, and if you did, you probably don’t need this article, so I will explore the outdoor options I mentioned. I’ve had the best luck building bonsai shelters on the East side of my house, right up next to my foundation. The North side may work as well, though mine is not as accessible, so I use the East. The North and East sides will receive the least amount of temperature fluctuation, you don’t need sunlight, you need a constant temperature. I place the trees on a small platform of bricks and lumber, to keep them off the ground and discourage insects from taking up residents in the pots. Then I build a crude chicken-wire hoop structure, leaving the top completely open (this is VERY important), but tall enough to be higher then the tallest tree. This is to discourage the larger pests from making a home under my branches and feeding on my tree trunks through the season. Next, I wrap the outside of the fencing with a tarp (construction plastic will work too) on the three exposed sides (remember, one side is next to my house) and secure it to keep the cold, drying winds from attacking my bonsai. I water as I would this time of year. Don’t stop watering! When the maple trees in my yard drop their leaves, I back fill my structures with the fallen leaves. This keeps the trees insulated, breathable and you can water though the leaves. As the snow begins to fall, I start to construct an igloo of sorts around the sides of the structure, again leaving the top mostly open. I build up the walls right up to the side of my foundation and put some snow on top to keep the constant temperature. Constant temperature, that is the name of the game! Assuming you work with species that can withstand our climate, keeping a constant temperature is how you keep your bonsai alive. The reason I keep the tops of my structures open is to keep from having a heat buildup during the day, only to drop and condense during the night. Keeping them next to my house ensure a little bit of warmth as my home will be warmer than my open yard. On the east (or north) side, keeps the least amount of sun. A shed works well as does an unheated garage. BUT, if you use your garage (open and closing the door two plus times a day) I would recommend another location as the temp exchange will be great as the big door open to park a car plus the heat from the car as it comes into the garage and cools off. This could be just enough to freeze/thaw/freeze your bonsai causing irreparable damages to the tiny branches and roots.